GNOME Shell's Activities Overview isn't a fully responsive grid based design. Activities are linear in a "one at a time" workflow found in mobile interfaces in a static layout. 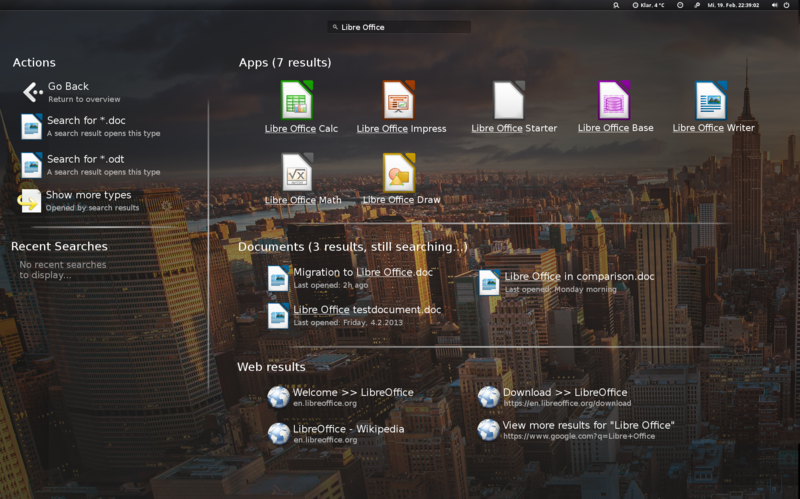 When GNOME Shell is running on desktops with large screens the Activities Overview fails to be responsive and adjust appropriately for that size or take advantage of the larger space. This design doesn't work for desktops and hurts productivity and awareness. Ideally the Overview should be a dynamic, active and powerful dashboard area. Think of a jet airplane cockpit with dozens of controls. Users should feel in control of their systems and have a frictionless non-linear workflow. They should be able accomplish complex tasks without having their awareness interrupted or constrained. The icon sizes are way too big, to much wasted space, low information density. Workspace Overview Strip is no longer visible affecting total awareness. Search results scaling is 500% more than it should be, low information density. More compact view could include rich information about non-app search results. Workspace Overview and Dash are both knocked out affecting awareness. Please feel free to provide any relevant examples of multitasking you might find in this section. It will provide some additional ideas and implementations to look at. Just be sure to follow the format described below. The images above are from the original GNOME design document dated 2009. 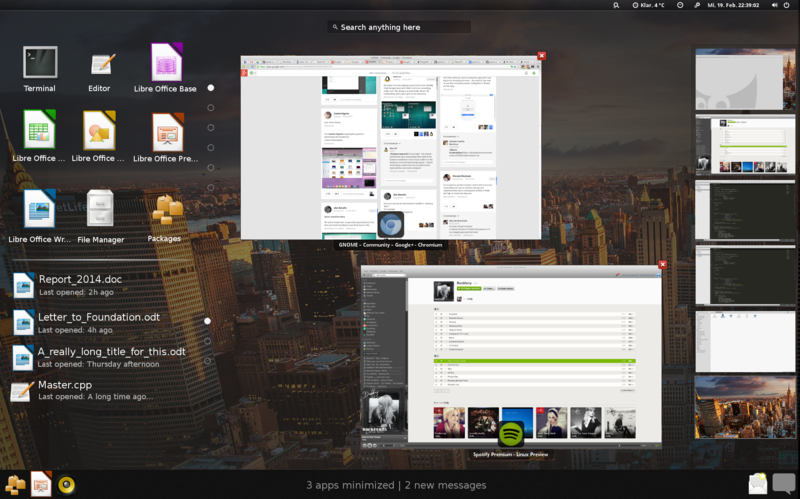 These show a more multitasking oriented Overview screen was the original design for GNOME Shell. Perhaps this indicates that the current GNOME Shell Overview suffers from usability regressions. Notice how in Windows 7 the Start Menu does not take up the entire screen. This allows the desktop to remain open and clear and does not affect overall awareness. When performing a search the results are in a very compact list. This saves space and allows for rich information to be communicated briefly. GNOME Shell could use a small compact search result style like this. Mac OS X "Spotlight" search tool is very similar to the Windows 7 search menu. Spotlight stays in a corner space does not take over the entire view affecting awareness. Notice also the compact list style, this saves space but increases information density. 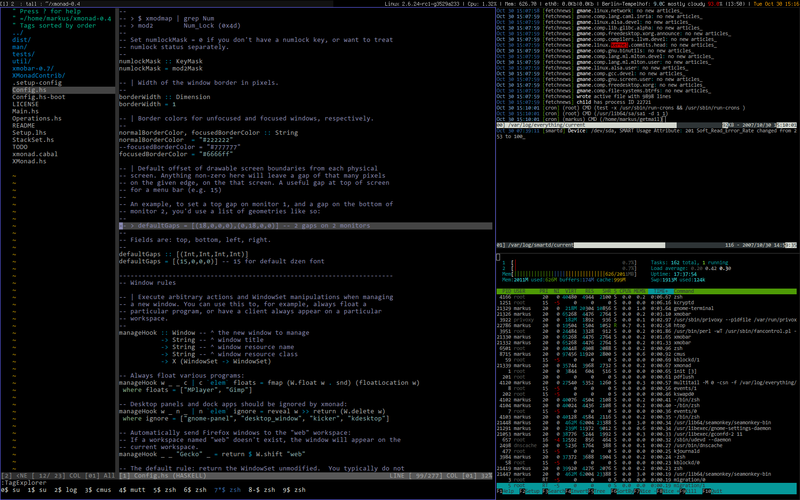 My solution to this problem is inspired by tiling window managers. Instead of having a linear sequence all items in the Activities Overview should be tiled and present simultaneously. This finally allows true multitasking in the overview. Items from the various menus can be dragged and dropped in other areas enabling useful shortcuts to common tasks. Feel free to put your own sketches or mock-ups here using a subheading. The example above shows the default view in "browse mode". Search mode as seen below and only activated when the user types something into the search box. Notice that everything is laid out in a very strict grid. The only elements that scale are the Window Picker views when the work-space becomes loaded with windows. This makes the Overview both solid and predictable. Items in the Overview would be treated as widgets and by hitting shift + right click the user can open a small configuration menu for each with options. These widgets could then be placed within "tiles" in the Overview and moved around or even scaled. Tiles spaces would also be re-sizable as well. The "widget" user-configuration functionality would really help extension writers because that functionality would already be built in so when new widgets are created via extensions they wouldn't have to rewrite their own methods. Terminal search widget that searches all open terminals and returns a text result. Background services widget that shows active background services with status items per service and even some simple action items. Could implement AlexGS widget idea. #721360 "Direct Access to App Grid"
#696351 "Dash Behavior With Lot's of Apps"
#701387 "dash: Stop including running apps"
#721359 "drag and drop to workspaces is not allowed from the grid"
#675768 "Application context menu in overview needs to scroll"
#693525 "Make Gnome 3.8 Shell Search interface intuitive"